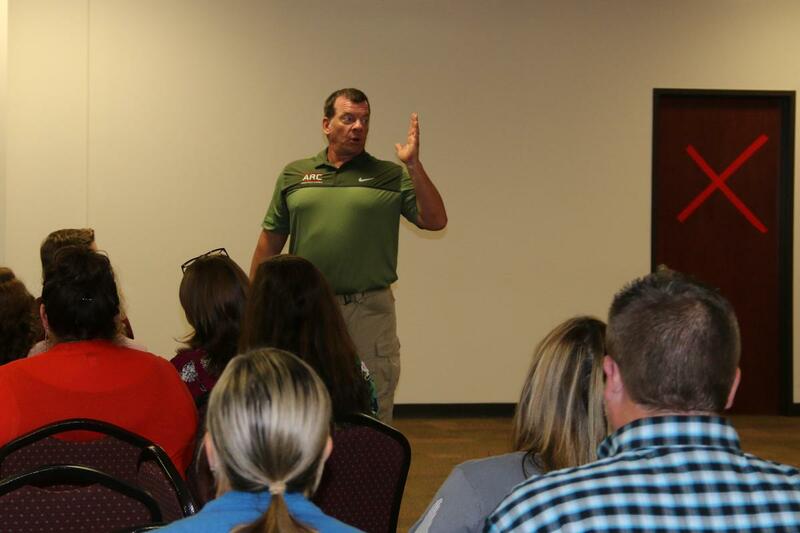 Magnolia, Texas (October 11, 2018) - Magnolia ISD recently completed an extensive, interactive safety training across the district with ARC -- Aware (of your surroundings), Ready (to act in a threatening situation), and Capable (of doing what needs to be done to survive). The training started in August with our constables and secondary campuses and recently wrapped up at the end of September with the elementary campuses and the administration office. Teachers and staff were placed in real-world scenarios with the sound of blanks being fired from a gun inside the building during the presentation. They had to quickly go into action to respond accordingly to the situation. One high school teacher said the experience was jarring but highly effective. Hine has 32 years in law enforcement working as a secret service agent for President Reagan, customs special agent, SWAT team and most recently for the Department of Homeland Security. With his experience and background, he is one of the founders of the company ARC. This year, MISD has invested $1 million into safety and security for the schools with the addition of constables at each of the campuses. This recent training is another resource provided to our staff as safety and security is the number one priority in the district.